From Democracy to Good Management? Focusing on the new institutional governance affecting health care and state education in the new millennium, Mattei offers a compelling analyses of the pressures 'from within' public organizations providing welfare services. In a broad comparative perspective, the book analyses current welfare reforms in Britain, Germany, France and Italy. 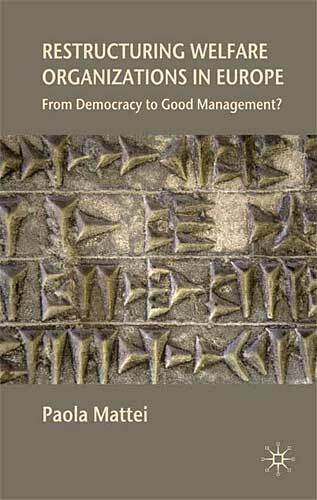 Mattei draws on recent work in public administration theory, and empirical new findings from public hospitals and state secondary schools, to develop an important argument about the variations of accountability relationships and the effects on the decision-making process. The book offers illuminating insights into the effectiveness of the new public governance of welfare organizations, pointing in particular to the implications for democratic accountability. In addressing the following question - how the relationship between political and managerial accountability is changing in welfare services - the book will be of interest to students and academics concerned with the development of the welfare state, as well as in the fields of comparative politics, social policy and public administration. Policy-makers and professionals engaged directly with managing welfare organizations will also find this book an innovative contribution to further their understanding of the role of managerialism in the modern transformations of the welfare state. European Welfare States and Democracy: Marching at the Same Tune? Paola Mattei is currently Research Fellow at the Mannheim Centre for European Social Research (MZES), University of Mannheim, Germany. She won the T.H.Marshall Fellowship at the London School of Economics for her research project on comparative welfare reforms in Europe, completed at the Transformations of the State Research Centre, Bremen, Germany and the Department of Social Policy, London School of Economics and Political Science, London, UK. She has published on comparative politics and public policy, including work on social administration and welfare state reforms.